"So you have escaped my labyrinth of words, and now you think you are free, do you? Well, I have news for you: Think again! Ha Ha Ha Ha"
Having just left the maze of words, your spirits sink to an all-time low, when the omnipresent voice of the mad wizard reaches you again. "Don't worry too much. The way is clear and easily marked on this map, my friends. All you need is to go from the blue arrow to the exit-path with the green arrow. What could be easier?" Looking at the little map, you get your hopes up. You've been through more difficult things in the past! "Of course, there is a catch. I will also give you two dice, and three more can be found in the maze." A set of two dice appears before you. "These dice will bind your very steps. Be assured there is a way to the exit, but you will never, ever find it. Ha Ha ha Ha Ha!" 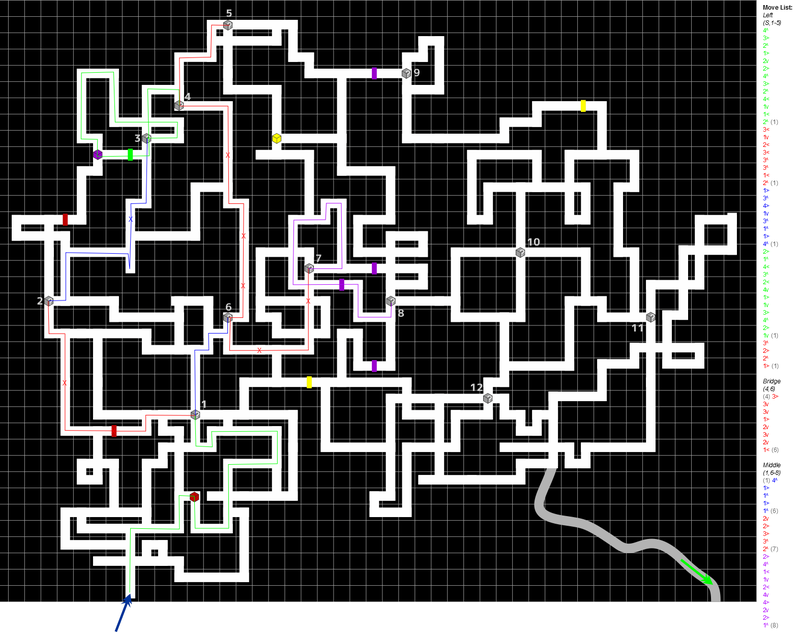 Look at the full-resolution map and notice the regular grid. A step from one square-centre to the next is consider 'one step'. You start on the square where the blue arrow points to. You win, when you reach (exactly) the square where the grey, winded path begins. You are given a blue and a green die at start. Each face of a die shows a direction and a number. You 'walk' through the labyrinth by following the instruction of the up-facing die face and then tilting the die to any side (90 degrees) to bring a new face up. You are not allowed to tilt the die back from where it just was. You always go exactly the given number of steps in the given direction. If this is not possible, then the move is forbidden. You are generally not allowed to switch the die you use, i.e. once you started with the blue die, you can only tilt and use that one. Finally, there are a few coloured blocks on the map. You may pass them only while using the die of matching colour for your movements. If anything is not 100% clear, please ask in the comments. User steps 4 fields "up" on the map, as shown by the top face. User steps 3 fields "right" on the map, as shown by the top face. User steps 1 field "up" on the map, as shown by the top face. I estimate that there are about 1,600,000 legal (but not necessarily reachable) states. In order to avoid having to handle every single one of them I used a simple breadth-first search algorithm to explore the reachable subset of states. I start with the 48 starting states (there are 2 dice to choose from, each die has 6 faces to start with, and each face can be oriented 4 ways). Then, for each new state I try to move the die according to its top face. If that move is allowed (doesn't cross any walls or wrong-colored barriers) then I add three new states in the new position with the three possible new orientations. There are two special cases. If the die lands on a colored die pickup, I add that color to the list of collected dice. If the die lands on a question mark spot, I add 24 new states (one for each orientation) for each of the collected dice. From Grey cube #4 in the path dcfyj found. Rotate left to go south 3. Rotate away to go south 3. Rotate left to go east 1. Rotate away to go south 2. Rotate left to go south 2. Rotate left to go west 1 and stop on a Grey cube. Building on what Business Cat posted. Start with the green die, initially pointing north 4. 2. Rotate toward you to go east 3. 3. Rotate left to go north 2. 4. Rotate left to go east 1 and collect the red die. 5. Rotate towards you to go south 2. 6. Rotate right to go east 2. 7. Rotate right to go north 4. 8. Rotate towards you to go east 3. 9. Rotate left to go north 2. 10. Rotate away to go west 4. 11. Rotate left to go south 1. 12. Rotate away to go west 1. 13. Rotate left to go north 2 and stop at a gray die. 9. Rotate right to go north 2. 14. Switch to the Red die. 16. Rotate Away to go South 1. 17. Rotate Right to go West 2. 18. Rotate Right to go West 3. 19. Rotate Right to go North 3. 20. Rotate Toward to go North 3. 21. Rotate Right to go West 1. 22. Rotate Toward to go North 2 and arrive at Grey Cube #2. 23. Change to the Blue die. 25. Rotate Right to go North 3. 26. Rotate Toward to go East 4. 27. Rotate Toward to go South 1. 28. Rotate Right to go North 3. 29. Rotate Toward to go North 1. 30. Rotate Left to go East 1. 31. Rotate Left to go North 4 and arrive at Grey Cube #3. 32. Change to the Green die. 34. Rotate Toward to go North 1. 35. Rotate Toward to go West 4. 36. Rotate Right to go North 3. 37. Rotate Toward to go West 2. 38. Rotate Left to go South 4. 39. Rotate Toward to go East 1. 40. Rotate Left to go South 1 and pick up the purple die. 41. Rotate Left to go East 3. 42. Rotate Away to go North 4. 43. Rotate Left to go East 2. 44. Rotate Away to go South 1 and arrive at Grey cube #4. 45. Change to the Red die. 47. Rotate Toward to go East 2. 48. Rotate Toward to go North 2. 49. Rotate Right to go East 1 and arrive at Grey cube #5. X's on the diagram show where, instead of going straight from one square to another, you stop halfway through (e.g. going 2 north then 3 north). 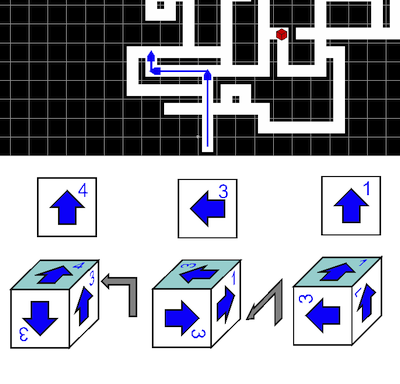 The list of moves on the right shows the turns you have to make for the cubes. - The first list is the left branch, which goes from the start through grey cubes 1 through 5. - The second list is the bridge, which connects the left and middle branches via grey cubes 4 and 6. - The third list is the middle branch, which starts at grey cube 1 connects it to 6 through 8. I'm going to use compass directions because I think it will be less ambiguous. North is up on the map (obviously). You can collect the red die if you start with the green die. You now have the green die with the 1 (on the right side of the mesh) pointing east. 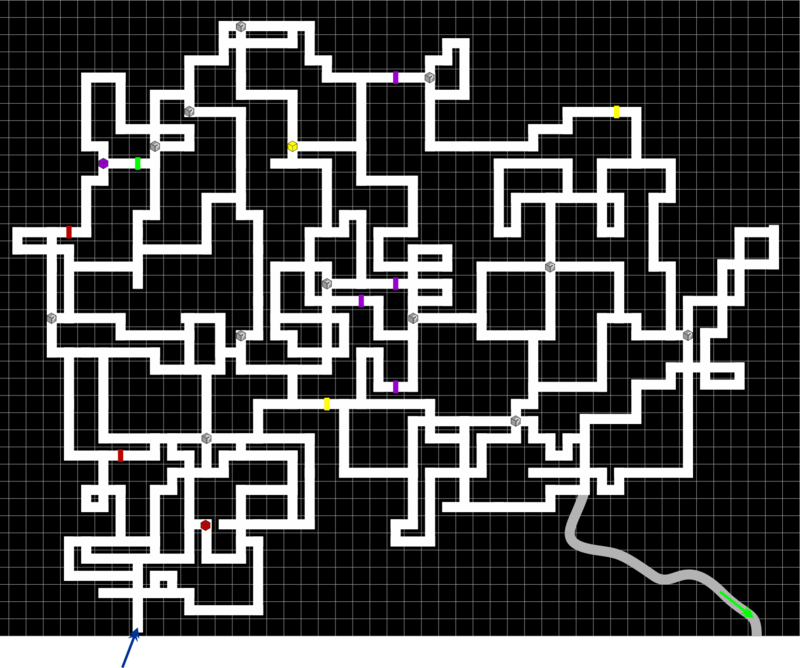 There are a relatively small number of ways to get to the end. 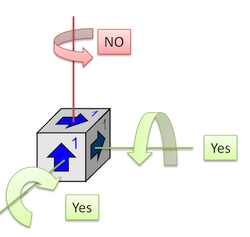 These can be represented as a series of 1 step moves: up, down, left, or right. All that being said, I'm not sure I could solve this, but could probably write a python program that could solve it. The puzzle has a relatively small number of state variables, so start a simulation and finish if and when you are at the end point. Not the answer you're looking for? Browse other questions tagged visual mazes three-dimensional or ask your own question.